Biofuels supporters won several key races in the election this year helping the ethanol industry maintain a base of legislative support. 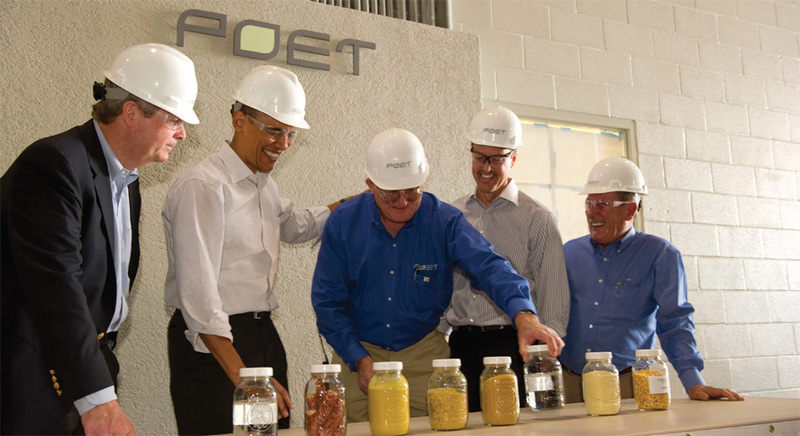 President Barack Obama visits POET Biorefining – Macon, Mo. in 2010. The ethanol industry enters 2013 in a strong political position, according to observers of the national government. 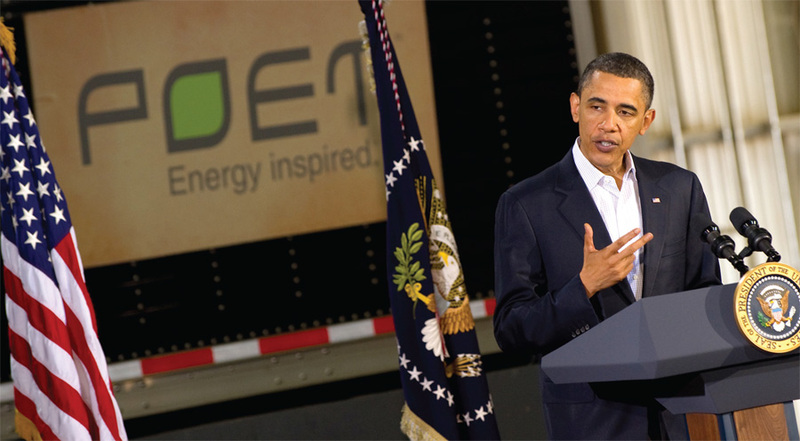 President Obama, who was re-elected on Nov. 6, has a track record of supporting the development of renewable fuels. In addition, supporters of renewable fuels won several key races for the U.S. Senate. That is expected to help the ethanol industry maintain an important base of legislative support. The U.S. House remains a wild card for future legislative support, however, because many representatives are considered strong supporters of the oil industry. The renewable fuels industry was in a no-lose position heading into the presidential election. Both major-party nominees – Democratic incumbent Barack Obama and Republican challenger Mitt Romney – had expressed support for renewable fuels during their contentious campaigns. Obama, a former U.S. senator from Illinois, will begin his second four-year term as the nation’s chief executive on Jan. 20. POET Senior Vice President of Public Policy and Corporate Affairs Kyle Gilley says that Obama’s history of supporting renewable fuels suggests continued administration support in legislation and regulation. During the campaign, Obama said that he would not let the oil industry dictate U.S. energy policy. He also has pledged to continue U.S. investments in biofuels. In 2010, Obama set a national goal to break ground on at least four, commercial-scale celluosic or advanced biorefineries by 2013, and the goal was reached. Supporters of the ethanol industry will not be able to sit back and assume the best, Gilley says, but at least they have support in the administration and in Congress upon which to build. Gilley sees the outcome of Senate races by Tammy Baldwin in Wisconsin and Joe Donnelly in Indiana as among the most noteworthy victories in campaigns for the U.S. Senate because supporters of ethanol beat clear critics. Tom Buis, CEO of Growth Energy, also considers the outcome of a Senate race in Missouri to be significant. In that contest, Democratic Sen. Claire McCaskill beat Republican challenger Todd Aiken, an incumbent House member. Growth Energy is a national trade association that represents ethanol producers and supporters. It is cochaired by Jeff Broin, executive chairman of POET’s Board of Directors. The organization intends to work with the President and members of the new Congress to expand market access to biofuels, such as E15. Groups supporting renewable energy also will try to point out to new members how developing renewable fuels can help create jobs, spur investment, revitalize rural areas, produce cleaner-burning fuels, reduce U.S. dependence on foreign oil and save money for consumers. Industry supporters point out that it’s easier to seek support among 100 senators than from among 435 House members. “It’s difficult to say where the House will go because Big Oil has a grip on so many members. So the wisest thing we can do with our resources and time is to make sure we have the support in the Senate to keep anything bad from happening,” says Brian Jennings, executive vice president of the American Coalition for Ethanol. Buis and others expect preservation of the federal Renewable Fuel Standard to be among the ongoing political battles faced by the ethanol supporters. The RFS law sets minimum volumes of renewable fuels to be made available in the U.S. market. The Environmental Protection Agency recently denied requests for waivers of RFS program, which was created in 2005 and expanded in 2007. “In 2013, we certainly anticipate Big Oil and Big Food to come after the Renewable Fuel Standard, and we’re prepared to fight that battle,” Buis says. Other issues looming large include the Farm Bill, which has provisions important to renewable fuels. Work awaits the federal government on issues such as tax credits to encourage the production and use of renewable fuels. The distribution network also needs to be expanded by, for example, encouraging the use of flex pumps at more gasoline stations. The industry appears to have a strong base of bipartisan support to begin work for the 2013 and 2014 sessions of Congress. In addition, the industry continues to have a high level of support in agencies such as Department of Agriculture, which is headed by Obama appointee Tom Vilsack, former governor of Iowa.